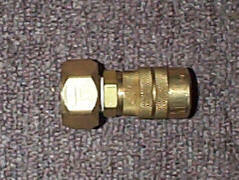 When you unscrew the water hose connector off the pressure gauge, wrap some teflon onto the male brass coupler and screw the water house connector onto it. Now you have the ability to safely water pressure (hydro) test your cannon. If it ruptures while filled with water, it will make a "ploomp" sound and pop open were the PVC pipe was weak. If you air pressure test it and it ruptures, the PVC pipe will shatter into many high speed projectiles! I have read horror stories of people losing body parts when their cannon explodes! 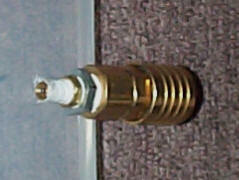 Water pressure testing your air cannon is one of the easiest things to do. If I haven't used my air cannon in a while, I water pressure test it to make sure it will still hold my safety zone of 105psi. 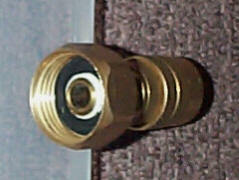 Take the female brass quick coupler from the 5PC brass quick coupler package, wrap teflon around the 1/4"x1/8" bushing and screw it in tight. 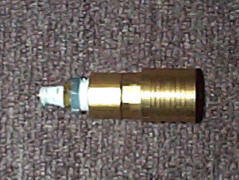 Wrap teflon around one of the 1/8" tank valves and screw it into the 1/8" bushing. Congratulations, you now have the ability to inflate you air cannon with a standing bike pump or something else that is portable.